First Post. Just testing. This is a picture of some baby ducks that I took near my office last May. What do they have to do with libraries? Well you see, I think ducks are an underserved population in libraries. 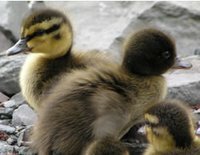 If we can get them to come in for quacky time when they're still fuzzy, cute, and let's face it a little impressionable, I think we'll have them for life.